How To Earn A Stack of Southwest Points — Without Even Flying! Sound familiar? I hear this all the time from people who don’t travel enough to earn miles by flying alone. Although flying is one way to earn miles, there are so many other ways to rack up serious points! There are lots of ways to earn frequent flyer miles that don’t involve ever stepping foot inside of a plane. Today, we are talking Southwest. It’s my favorite airline for domestic and Caribbean trips. Not only is their frequent flyer program easy to use, their customer service is top notch, and there are no checked bag or change fees. Rapid Rewards is Southwest Airline’s frequent flyer program. It’s straightforward and easy to use. 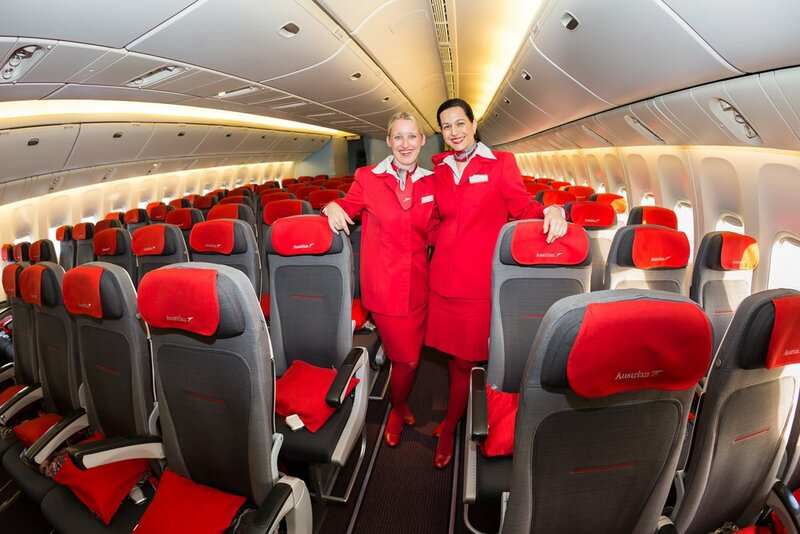 Each flight’s price in Rapid Rewards points is dependent on the cash price of the ticket. You can expect to get right around 1.5 cents per point value. Plus, there are no blackout dates: if a cash ticket is available, you’ll be able to purchase the ticket in points. Hot Tip: Rapid Rewards points don’t expire as long as you have flight- or partner-earning activity at least once every 24 months. You can earn Southwest Rapid Rewards points through Southwest credit cards, plus Chase cards that earn Ultimate Rewards points. Chase Ultimate Rewards points transfer to Southwest at a 1:1 ratio, so any Ultimate Rewards points you have can be easily turned into Rapid Rewards points. You might be surprised to know that the best-earning rate for Southwest points isn’t on the Southwest credit cards! Many of the Chase credit cards offer better bonus categories and larger sign-up bonuses and are therefore a better long-term option. Don’t forget, when collecting Chase points you have the option of not only transferring to Southwest but also many of their other airline and hotel partners. This makes so much more sense than pooling all your points with just Southwest! However, don’t count out the Southwest cards. They have nice sign-up bonuses and points earned from these cards count towards the Southwest Companion Pass. Log on to your online Chase account. Go to the Explore Products drop-down menu at the upper left-hand corner of the screen and select Your Offers. See the cards you have that are offering a referral bonus. Click on the card to access your referral link. Refer your friends to earn bonus credit card points! Marriott points transfer to Southwest at a 3:1 ratio. For every transfer of 60,000+ points, you get a 5,000-Southwest point bonus. If you like the idea of a Marriott Hotel+Air package but are short on points, don’t forget you can transfer Chase Ultimate Rewards points to Marriott at a 1:1 ratio. 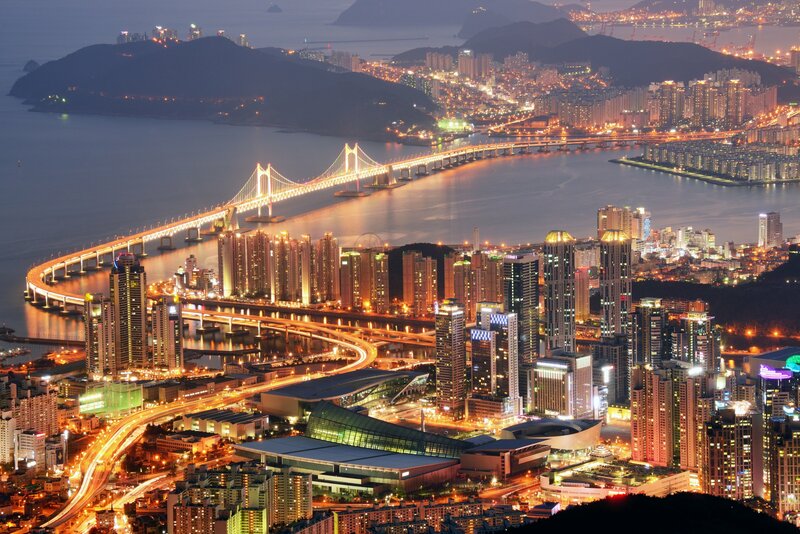 See our article on the best ways to earn Marriott points for more information. 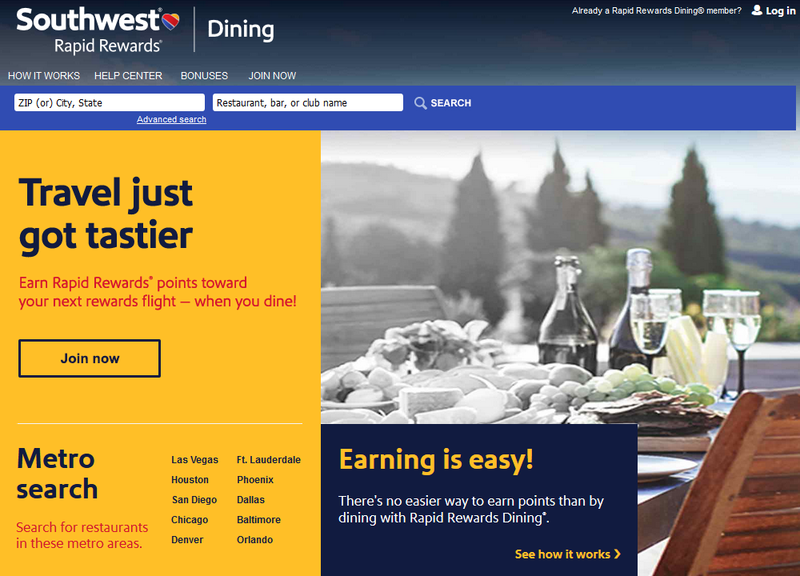 You can earn Southwest Rapid Rewards points just by going out to eat through Rapid Rewards Dining. When you join Rapid Rewards Dining and dine at a participating restaurant and pay with your registered card, you’ll earn bonus Southwest points. There are participating restaurants all over the country. You can search for a specific restaurant or search by region. Or register your credit card and get surprised when bonus points pop up in your account! It’s easy to earn bonus points just by going out to eat. Just sign up with Rapid Rewards Dining! Image courtesy of RapidRewardsDining.com. Go to rapidrewardsdining.com and log in with your Rapid Rewards account credentials. Register a credit card with your Rapid Rewards Dining account. Visit a participating restaurant and pay with your registered card. The Rapid Rewards Dining program offers some bonus ways to earn additional points. New member bonus: 1,000 Rapid Rewards points after dining 3 times. First step bonus: Earn 500 bonus points after you have earned 1,500 points through dining. Thank you bonus: Earn 300 bonus points each time you earn 1,000 points by dining. Review bonus: Earn 10 bonus points each time you complete a review of your dining experience. Hot Tip: Rapid Rewards Dining occasionally offers even more bonus points for new members who dine and review their experiences in the first 30 days of membership. Visit www.rapidrewardsdining.com for up to date bonus offers! Another way to increase your points earning through the dining program is by registering a Southwest credit card (or better yet, a Chase card that earns 2x or 3x points on dining) to your account. This way, you can double dip on Rapid Rewards points. If you happen to hold the Chase Sapphire Reserve card, you can max out your points earning since this card earns 3x points at restaurants. 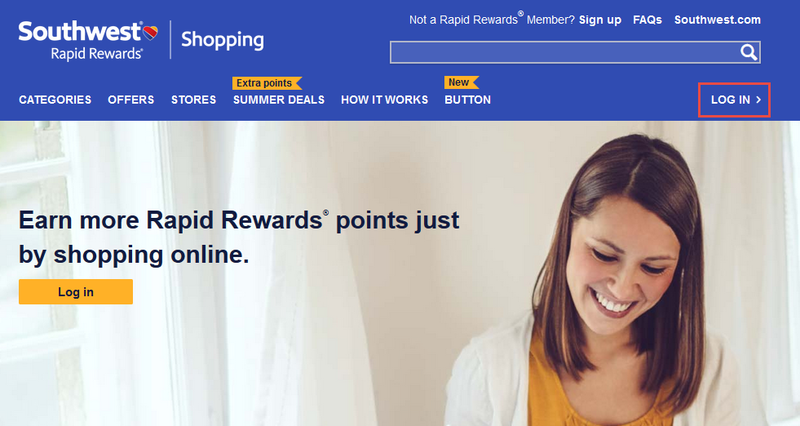 If you want to earn lots of Southwest points, you should check out the Rapid Rewards shopping portal. This site allows you to earn points through your everyday online spending. As with their dining program, you can double dip by using your Southwest credit card or a Chase Ultimate Rewards points credit card. Sign up for a Rapid Rewards account if you haven’t already. Log in on RapidRewardsShopping.Southwest.com by clicking the log in button in the top right corner of your screen. Enter your Rapid Rewards account number or username and password. Start shopping! Search for the store you want to shop at and click through to that website to make a purchase. Points will be posted to your account in about 6 to 8 weeks. Each store offers a different number of points per dollar spent plus many offer specials and deals throughout the year. Before clicking through, make sure you know the terms of each offer to verify that your purchase will earn points. 5,400 points: Upgrade your mattress with Dreamcloud plus get $200 off. 3,600 points: Get financial advice from The Motley Fool. Any order will earn 3,600 points. 2,700 points: Switch your wireless carrier to T Moblie (with a qualifying plan). 1,800 points: Purchase a mattress from Nectar plus get 2 free pillows. 1,100 points: Sign up for a new Hulu subscription. 1,100 points: Sign up for a Robb Vices luxury goods subscription. 1,100 points: Subscribe to The Economist. 900 points: Make dinner easier with a Blue Apron subscription. Click on one of the featured or top stores, or type in the store’s name in the search box at the top of the page. Image courtesy of RapidRewardsShopping.Southwest.com. This list is by no means complete. There are tons of stores offering bonus Rapid Rewards points! Next time you need to make an online purchase, start at the Rapid Rewards shopping portal to check if your store is offering bonus points. You’ll be on your next Southwest flight in no time! 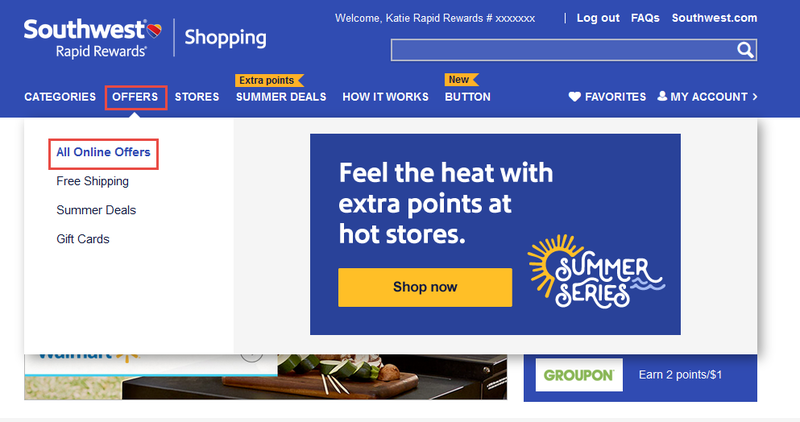 Bottom Line: The Southwest Rapid Rewards shopping portal offers bonus points for many different online stores and subscription services. 2. Click on Offers>All Online Offers on the top toolbar. 3. Scroll to the middle of the page under All Online Offers. 4. Then sort this list by Highest Earn Rate. This will show you all of the current offers with the highest points earning potential. While I don’t recommend making purchases that aren’t useful to you, you may be able to find deals for items or services that you need. And occasionally, you might find an offer for something you don’t need at all, but the points make it worth it: I once got 1,000 points for a $1 magazine subscription! 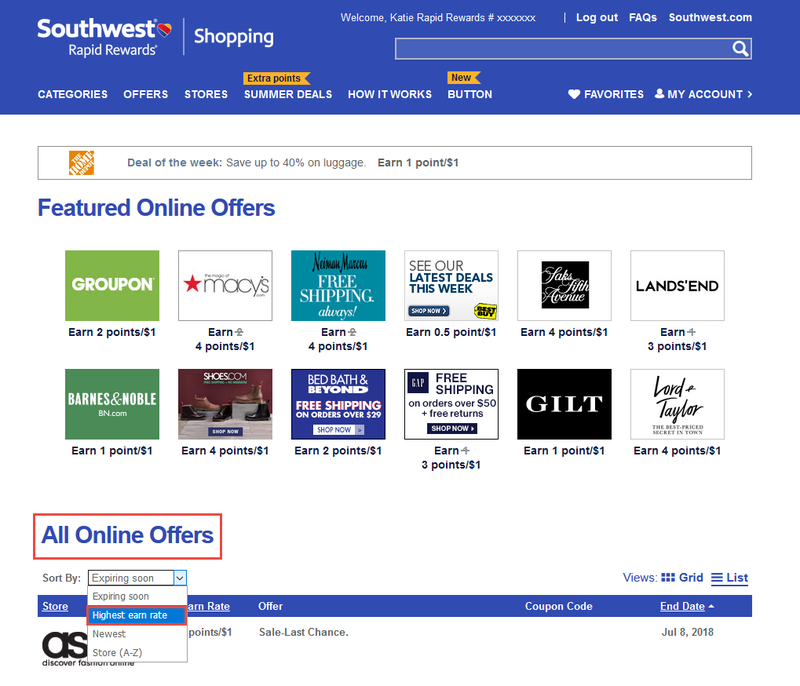 If you tend to forget to start your shopping on a shopping portal, consider getting the Southwest Rapid Rewards Button. The button will allow you to see points earning rates in your search results, plus it will remind you to go through the Rapid Rewards shopping portal. The catch is that this button is currently only available on Google Chrome. Remembering to use the Rapid Rewards portal is easy if you use Google Chrome. Image courtesy of RapidRewardsShopping.Southwest.com. Did you know that you can earn Southwest Rapid Rewards points at hotels? SouthwestHotels.com is Southwest Airlines’ partnership site with Booking.com. It’s an OTA (Online Travel Agency) where you can book a hotel and earn Southwest points at the same time. In addition to hotels, you can book apartments, B&B’s, motels, homestays, campgrounds, and even hostels on this site. Hot Tip: Be aware that bookings made on SouthwestHotel.com are pre-paid and non-refundable. One quirk I found with this site is sometimes the bonus points you earn can increase exponentially with the number of nights you book. 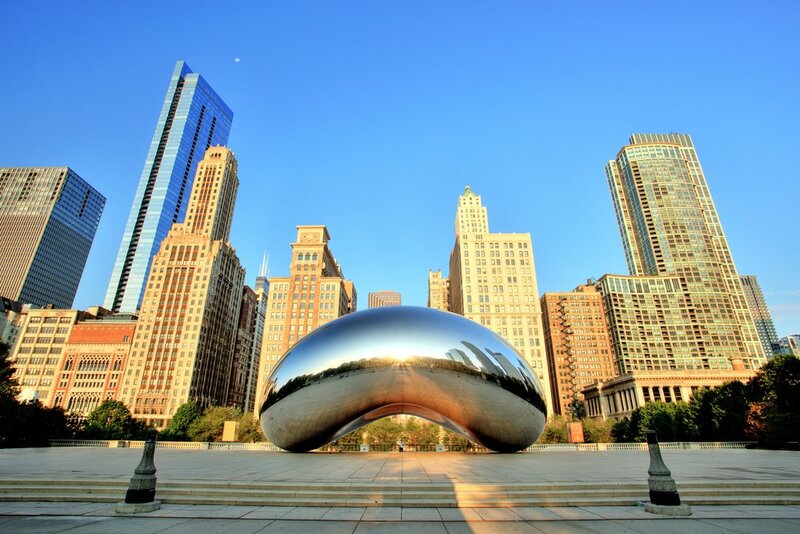 Check out this listing for the Ritz-Carlton in Chicago. When you book 1 night through Southwesthotels.com, you can earn 419 bonus points. However, if you book 3 nights, you can earn 20,000 bonus points! You can earn bonus points by booking your hotel through SouthwestHotels.com. Image courtesy of southwesthotels.com. The number of bonus points you can earn is not necessarily tied to the price of the room. Image courtesy of southwesthotels.com. Rocketmiles is another website that rewards you with Southwest Rapid Rewards points when you book a hotel on the site. You can expect to earn 1,000 to 10,000 bonus points per night. However, you won’t earn any additional hotel loyalty points. Searching for a hotel on Rocketmiles is similar to any other OTA. Once you have your list of search results, you will be able to see the number of Rapid Rewards points you can earn with each booking to the right of the screen underneath the price. The price shown is per night, but the points value shown is for the whole stay. Hot Tip: You will NOT earn hotel loyalty points from any stay booked on Rocketmiles and any elite status you have with a hotel may not be recognized. You can earn Rapid Rewards points each time you stay at a Best Western. Just set your Best Western Rewards earning preference to Partner Rewards>Southwest Airlines. Then show your Rapid Rewards account number at check-in. You can also transfer Best Western Rewards points to Rapid Rewards points. When you stay at a participating Radisson brand including Radisson Blu, Radisson, Park Plaza, Park Inn by Radisson, and Country Inn & Suites by Radisson, you can earn Southwest points. All you need to do is provide your Rapid Rewards number at check-in. Earn Southwest points for each qualifying stay at a Choice hotel across the United States, Canada, Europe, Middle East, Mexico, Central America, Australia, Asia, and the Caribbean. All you need to do is provide your Rapid Rewards number at hotel check-in. You can also transfer your Choice Privileges points at a rate of 6,000 Choice points for 1,800 Rapid Rewards points. If you are a World of Hyatt member, you can earn an additional 600 Rapid Rewards points for each qualifying stay at select Hyatt hotels. Participating brands include Park Hyatt, Grand Hyatt, Hyatt Regency, Hyatt, Andaz, Hyatt Centric, The Unbound Collection by Hyatt, Hyatt Place, Hyatt House, Hyatt Ziva, and Hyatt Zilara. To qualify for Rapid Rewards points, each stay must be booked directly through Hyatt, and Rapid Rewards points need to be selected as your currency of choice. In addition, you can transfer World of Hyatt points to Rapid Rewards points. While the transfer rate isn’t spectacular, it’s good to know your options if you need to top off your account for a redemption. La Quinta Returns members who provide both their La Quinta and Rapid Rewards membership number upon check-in can earn bonus points for each qualifying stay. You can transfer 6,000 Returns points into 1,200 Rapid Rewards points. Hot Tip: Points transferred to Southwest Rapid Rewards from hotel partners do NOT count towards the Southwest Companion Pass. To earn points, you will need to change your earning preference to Southwest Airlines Rapid Rewards instead of Marriott Bonvoy. Then, provide both numbers upon check-in. M Life (MGM’s loyalty program) members staying at Bellagio, ARIA, Vdara, MGM Grand, The Signature at MGM Grand, Mandalay Bay, Delano Las Vegas, The Mirage, Monte Carlo, New York-New York, Luxor, or Excalibur can earn Rapid Rewards points for their stay. Both your M Life and Rapid Rewards membership numbers need to be attached to your reservation to qualify. Renting a car is something many of us do while on vacation. Why not earn some extra Rapid Rewards points at the same time?! We even have an entire post dedicated to maximizing your SWA points through car rentals! Hot Tip: When booking a rental car through any of the below Southwest links, be sure to add your Rapid Rewards number to earn your bonus points. Earn up to 1,200 points on each car rental at participating U.S. locations through January 31, 2019. Book here using Contract ID 7016141. Earn up to 2,400 points on each car rental at participating U.S. airport locations through January 31, 2019. Book here and use MUAA042 in the Coupon Code field and K024700 in the Avis Worldwide (AWD) field. Earn up to 2,400 points on each car rental through January 31, 2019. Reservations must be made through Southwest to receive bonus points. It’s easy to earn bonus Rapid Rewards points when renting a car. Earn 1,200 Rapid Rewards points when renting a mid-size or larger vehicle through January 31, 2019. Use promotion code 100389. Earn up to 2,400 points on each car rental through January 31, 2019. Book through Southwest or use promotion Code 159062 and CDP 205418. Earn up to 2,400 points on each car rental at participating U.S. locations through January 31, 2019. Book here using contract ID 5030510. Earn 1,200 Rapid Rewards points on your next rental booked and completed by January 31, 2019. Click here to book and use promotion code SWP060. Bottom Line: To view the most up-to-date rental car points offers or to book a rental car through Southwest, go here. Each time you reserve SuperShuttle’s shared ride airport shuttle or Execucar’s private sedan service, you can earn up to 300 Rapid Rewards points (150 points each way). Reservations must be made at rapidrewards.supershuttle.com. The name on the reservation must match the name on your Rapid Rewards account. Only one member per reservation can earn points. Provide your Rapid Rewards number at the time of booking. Earn Rapid Rewards points with any Laithwaite’s Wine purchase. Earn 2,000 bonus Rapid Rewards points on your introductory wine club case purchase. Earn 1,000 bonus points on each future wine club case purchase. Earn 3x points on non-club purchases. Call 1-800-Flowers (1-800-356-9377) and mention promotion code RR22 along with your Rapid Rewards number. You can earn 1,000 bonus Rapid Rewards points with each Harry & David order over $29.99. Visit www.harryanddavid.com/rapidrewards and enter code SW44 plus your Rapid Rewards number (in the Membership ID field) to earn your bonus points. If you live in IL, MA, MD, NJ, OH, or PA you can earn Rapid Rewards points by choosing NRG Home as your electricity supplier. After being a customer for 2 months, you can earn a 10,000 point enrollment bonus. If you continue to be a customer, you can earn 2 points per dollar on the supply portion of your energy bill. If you are also a Southwest credit card holder, you will earn an additional 2,500 points on your enrollment bonus (12,500 points total), plus you will earn an additional 1 point per dollar on the supply portion of your energy bill (for a total of 3 points per dollar). You must already be a cardholder at the time of your NRG enrollment to qualify. Call NRG Home at 1-855-674-7697 and mention offer code SWA-7202-047. Have your Rapid Rewards number and a recent energy bill available. If you live in Texas, you can enroll in Reliant Secure 24 Plan with Rapid Rewards. You will earn a 15,000-point enrollment bonus plus 500 points each month for 24 months for a total of 27,000 Rapid Rewards points over a 24-month term. Sign up online or call Reliant at 1-866-222-7100 and mention offer code XW1193. Have your Rapid Rewards account number available. Sign up for the MakeItCount™ program to earn Southwest points at Marathon gas stations. Sign up online at makeitcount.com/rapidrewards to earn 1 Rapid Rewards point for every gallon of fuel purchased. These bonus point opportunities take a little more time than just clicking through a shopping portal, but when points are involved, sometimes you have to get creative to earn all that you can! Earn Rapid Rewards points just for participating in various market research surveys. This program is free to join, and you can participate as much or as little as you want. The catch is that enrollment happens during random times of the year. Click here for more info and to keep track of the next enrollment opportunity. You can earn points by participating in the e-Rewards® Opinion Panel. You will earn e-Rewards Currency for participating in market research surveys which can then be transferred into Rapid Rewards points. This one also has limited enrollment periods. Click here to keep track of the next enrollment opportunity. PlacePass allows you to earn Rapid Rewards points by booking tours and excursions for your next trip. Choose from both domestic and international activities and earn 1 point per dollar. To search and book an activity, visit southwest.placepass.com. Southwest Vacations offers package deals including flight, hotel, car rental, and activities. You can often find deals that offer bonus Rapid Rewards points on top of any points you receive for the flight portion of the package. While certainly not a primary tactic to accrue points, there’s always the opportunity to flat-out buy Southwest points! 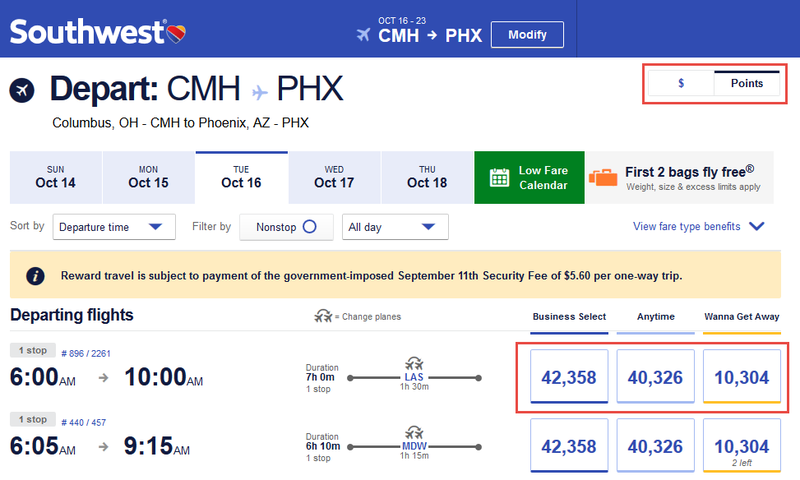 We’ve created a guide on buying Southwest points and when it makes sense to do so. Hot Tip: What if you’ve got a stack of SWA points but no travel on the horizon… are there other ways to use them? There sure are! Check out our article dedicated to just that! As you can see, there are tons of ways to earn Southwest Rapid Rewards points, all without flying a single mile! Don’t forget you can also earn points the old-fashioned (but still fun) way: taking a Southwest flight. Some of these earning methods take a little bit of effort and planning, but if Southwest points are what you’re after — it can be worth it! How can I earn Southwest points without flying? To earn Southwest Rapid Rewards points without flying, try one of these ways: get a Southwest credit card, get a Chase Ultimate Rewards credit card, transfer Chase points to Southwest, stay in a hotel, rent a car, do some online shopping, book an activity for your next vacation, purchase a Marriott Hotel + Air package, go out to eat, order wine, send someone flowers, or participate in a market research survey. Can I transfer points to southwest from another program? Yes, you can transfer Chase Ultimate Rewards points to Southwest at a 1:1 ratio. If you have lots of Marriott points, you can purchase a Hotel+Air package, which transfers 50,000 to 120,000 points to Southwest. 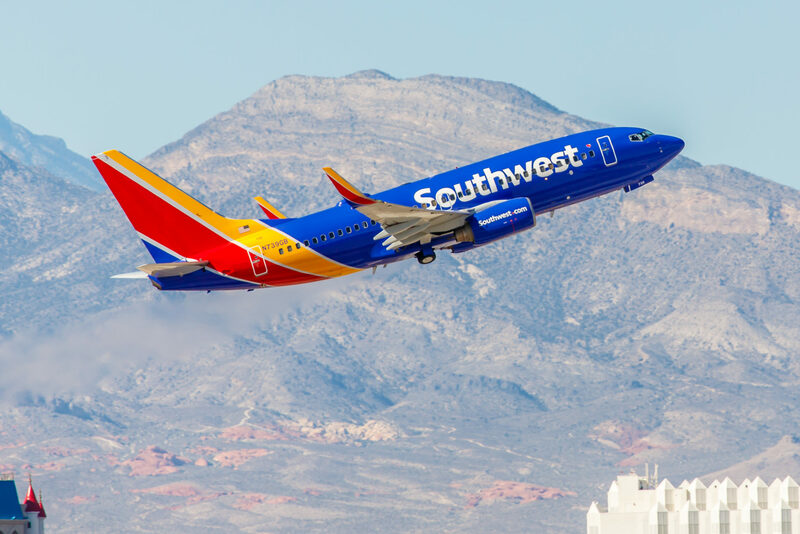 How can I earn Southwest points with a credit card? You can earn Southwest points through the Southwest Rapid Rewards® Plus Credit Card, Southwest Rapid Rewards® Premier Credit Card, or the Southwest Rapid Rewards Premier Business Card. Or sign up for a Chase card such as the Chase Sapphire Preferred. The Ultimate Rewards points you earn with this card can be transferred to Southwest. Is there a benefit to making your earning preference as southwest rapid rewards vs accumulating marriott points and transferring them over in bulk? When you set your Marriott earning preferences to Southwest, the transfer rate isn’t great. I would only do that if you have a boat load of Marriott points and just need to top off your Southwest account. Without setting your earning preference to Southwest, the only way to transfer Marriott points into Southwest is by purchasing a Hotel + Air package. The miles portion of this package transfers at a 1:1 ratio. For example, if you need 50,000 Southwest points, you would have to transfer 140,000 Marriott points to make that happen. Or you could purchase a Marriott Hotel + Air package for 200,000 points which also gets you a 7 night stay at a Category 1-5 hotel. The Hotel + Air package is a better deal (IF you have the extra Marriott points!). Hope that helps! @katie If you have both southwest and a Chase Sapphire card, can you double dip on points if you purchase Southwest Vacations to get a hotel (those 10,000 points ones) and would Chase give you 2x points as well? I’ve never done it, but I think it should work. That would be a great way to earn lots of points – hope it works for you! !